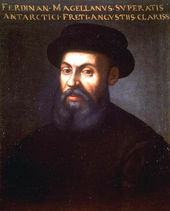 Portuguese navigator Ferdinand Magellan set sail from Spain on September 20, 1519, with five vessels and about 265 men. Sighting the South American coast near Pernambuco, he searched for a suspected passage to the South Sea and ultimately discovered the strait that bears his name. On March 6, 1521, Magellan reached the Marianas and 10 days later the Philippines, where he was killed in a battle with the natives. How many of Magellan's original crew members returned to Spain alive? The USS Spiegel Grove was a US Navy dock landing ship that was slated to be intentionally sunk off the coast of Florida to create an artificial reef. On May 17, 2002, the Spiegel Grove sank prematurely and ended up upside down on the sea bottomâ€”a position that was corrected in 2005 when Hurricane Dennis forced the ship right-side up. After the ship was sunk, the site was opened to recreational divers, drawing thousands of visitors. How many divers have died exploring the wreck?